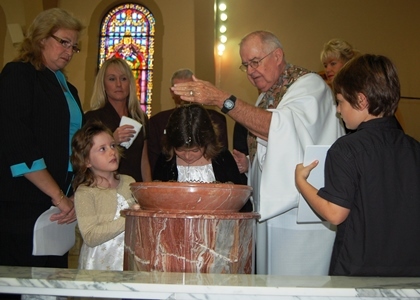 Parents must contact our Religious Education Department to attend the Baptismal classes. Instructions are held in the Parish Conference Room on the 2nd Monday of each month from 7:00 p.m. to 8:00 p.m.
Baptism takes place regularly every Sunday at 5 p.m. or by appointment with your chosen clergyman. Call our Religious Education Department to schedule the date and time of your child(s) Baptism.